When did everyone get on the rhubarb train? I mean really! I've sort of grown up with rhubarb- my grandmother had tons of the stuff growing in her garden. It was always served to me, cooked to death with tons of sugar. No biggie- as a kid, anything with sugar rules...even something with such a...rhubarb taste! Over the years though, the darn thing grew on me. But because it's such a seasonal item and because (other than my mom) no one else in the family likes it...it's rarely served. Sad news for someone like my mom who would literally eat it everyday. I seriously think she'd take rhubarb pie over apple pie (gasp!!! I'm not that big of a fan). Well just her luck, Mother's Day was coming up and in an attempt to make the day truly all about her I headed to the store to get some of the stuff. Made this dessert, we ate it, she (and the rest of our rhubarbaphobics<-- swear that's a word) loved it!! The end. 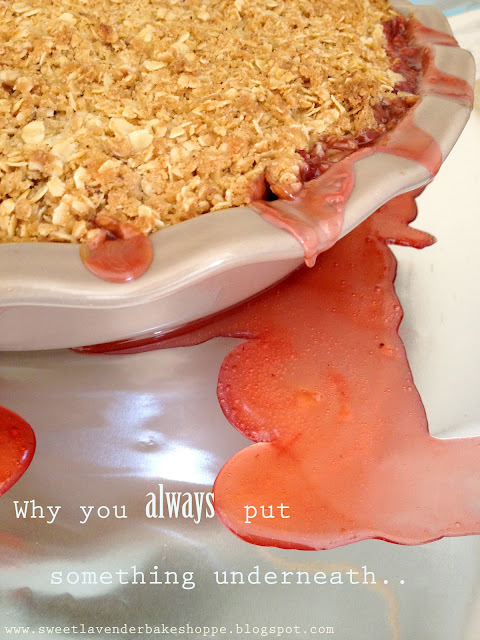 But then...all of a sudden up pops rhubarb-everything. Pictures on Instagram, pins on Pinterest, posts on Facebook and Twitter. Seriously...all around me. I can't believe it! When did it get so popular?? I swear I just bought some because it was my mom's special day and I wanted to make her a dessert I knew she'd adore. I knew having rhubarb in it would make it a sure win. I'm glad I did! Because now I'm a part of the rhubarb phenomenon! Lucky me! Well, and lucky you. Because now, I've been inspired to post the delicious recipe which I promise you- you will just adore. Even your rhubarbaphobes- I'm pretty secure in saying they'll love it too. 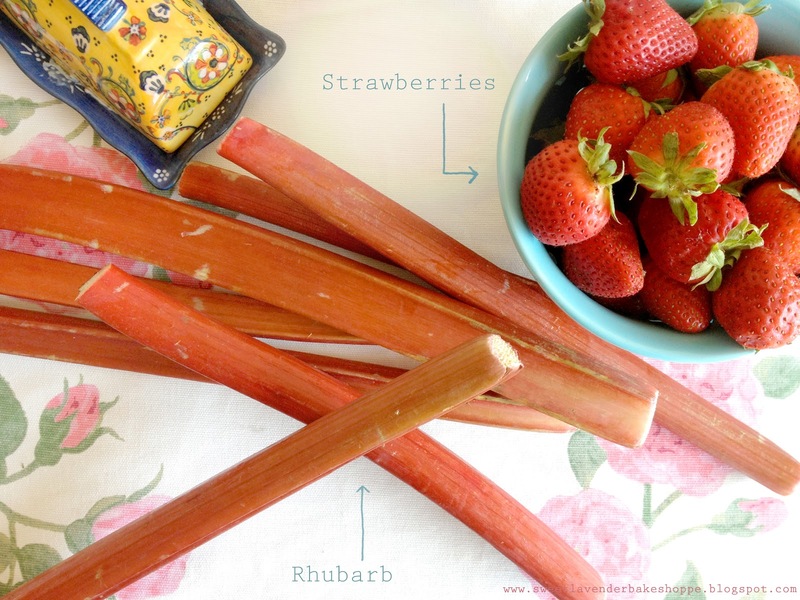 Trust me- if my dad (King I Loathe Rhubarb) can eat a whole serving and then come back for more nibbles...if he can say "huh, pretty good!" it's a definite crowd pleaser. Strawberries are included so that those phobics can exhale a breath of relief knowing they're not committing 100% to eating the stuff. 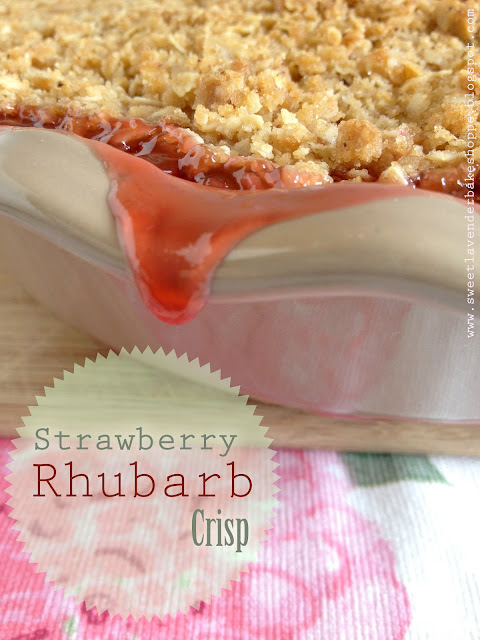 Plus strawberries and rhubarb make for a pretty tasty combination, if I may say. It's the simplest thing to make as well. Everything gets chopped up, tossed around with some delicious vanilla sugar, topped with the most delicious brown butter crumble (you've ever had), and baked until juicy and tender with a crisp top. It's the perfect combination of warm, gooey, sugary soft filling and buttery, crunchy, sweet topping. I included both vanilla sugar and extract to give a double POW! of vanilla. You can never have too much vanilla, in my opinion. Rhubarb is IN season NOW! So pick some up next time you see it, and make this stat! 1. First things first. Preheat your oven to 375*F. Line a baking sheet with parchment or foil and set aside. 3. 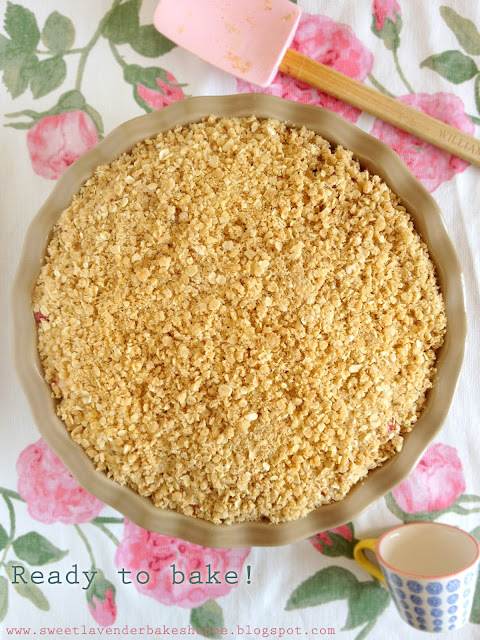 Next make your crumble! In a saute pan, add your stick of butter and cook over medium low. Allow to melt completely and continue to cook. It will foam up and then slowly the foam will die down. Once the foam starts to disappear you've got your brown butter! It should smell nice and nutty and be a slight golden brown color :) Remove from heat. 4. In a bowl mix together your oats, flour, brown sugar, salt, and browned butter. Stir to combine completely. 5. Cover the top of your fruit with your crisp topping and press down very gently. 6. Place dish on your lined baking sheet and bake right away! Bake for 45 minutes or until bubbling and oozing and topping is golden brown. 7. Let cool about 5-10 minutes and then serve! Great alone, with a dollop of fresh whipped cream...or even better- a scoop of homemade vanilla ice cream. MmmmmmmMm! Best if served day of and still warm from the oven. But if you can't (like I couldn't)- you can totally make the day before your big event. Just let cool completely, wrap in plastic wrap, and refrigerate. Then come dessert time, unwrap and reheat in a 350*F oven for 20 or so minutes. Let me know if you guys make it! I'd love to hear how it went :) I'm thinking I may do a Mother's Day recap...show you guys what we got..errr made...the lovely ladies in our lives ;) Yeah, I think I shall! Stay tuned! What a fantastic memory! I think the only way one can eat the stuff is covered (or dipped) in sugar! Right??? I'm out of it, I didn't even realize it had become popular! My dad grew up on it and lovvvvvvvves it! I bet he'd love this recipe, will have to share it! Not a dumb question at all! I'll go in and change it for you- but usually 1# or "#" means "pound". :) If you're confused I'm sure someone else was as well! Thanks for the heads up! This recipe is so amazing. Making it for the 2nd time in the last month. This time making it in 8 little pie tins to share with friends. Thank you so much for sharing! Oh lovely! That's so encouraging!!! !